I have France on the brain this week, or more precisely, French food. It started with an extraordinary lunch at one of my new favorite restaurants, Maximilien. I went with my best girlfriend, Constance. We are lucky enough to work within walking distance of this wonderful place, and it's becoming somewhat of an addiction. Max's, as we now so familiarly call it, is located in Pike Place Market. It has not only some of the best food I've ever tasted, but an absolutely gorgeous view of Elliott Bay. I cannot recommend the experience highly enough. On our most recent visit I had the Tarte Flambée Paysanne, and have not stopped thinking about it since. When the waiter placed it on the table before me Constance said, "that puts any pizza to shame." No doubt. It may have been round and had cheese on top, but I've never tasted any pizza like this. The pastry crust was tender and crispy, just substantial enough to hold up to its toppings. Those ingredients made up one of the most blissful combinations I've ever tasted; créme fraîche, thinly sliced ham, potatoes, goat cheese and herbs. It was mind-blowing, life-changing, make-your-toes-curl, delicious. Have you ever eaten something that was so good it almost made you weep? That's what I'm talking about. If you're local, go there. If you're not, come visit and I'll take you. So that's what I had on my mind this week...cooking, French food, and Constance; my faithful friend and dining companion. It all came together as I was thinking of what recipe I wanted to make for this post. I came across an old favorite in the search, Gougère. Constance gave this recipe to me at my wedding shower several years ago, and I've always loved it. Gougère, or Gougères, is a savory, cheesy, French pastry. It is crisp on the outside, delicate on the inside. 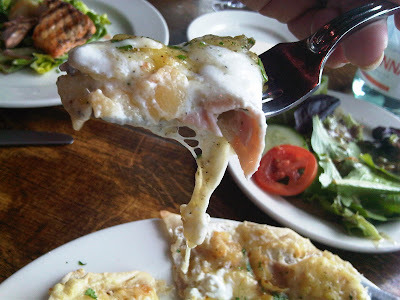 It has a somewhat eggy, cheesy, toothy texture within; which is lightened by airy bubbles under its crust. It's relatively easy to make, and smells divine while baking. Your house will smell like a giant cheese puff. I recommend investing in a decent quality cheese for this recipe. I used a French Gruyère and it had a wonderfully nutty, slightly sweet flavor. Preheat oven to 400 degrees. Butter a large baking sheet, or cover baking sheet with buttered parchment, or use a buttered glass pie dish. All options work, but glass seems to work best. 1) Put butter, water and salt in a medium-large saucepan and heat, stirring frequently until butter is melted and mixture comes to a boil. 2) Remove pan from heat and stir in flour, stirring constantly until dough forms and comes away easily from sides of pan (a minute or so). 3) Beat in eggs, one at a time. Then beat in the cheese. 4) Placed heaped spoonfuls of mixture on baking sheet, one against the other, in the shape of a ring (or a wonky sort of triangle like I accidentally did, whatever). You may sprinkle a bit more cheese on top before baking if you wish. 5) Bake Gougère at 400 degrees for 40 minutes, or until puffed and brown; adjusting as needed for your oven temperature, and the size of your pastry. Just watch toward the end of cooking so you don't over-bake. 6) Remove from oven and serve immediately, or when cool. I cooled mine on a wire rack to avoid losing any crispiness on the bottom crust as it cooled. You can store in a plastic bag for a few days in the fridge. Reheat at 350 degrees for 5-10 minutes. This pastry had a deeply golden brown and crunchy crust. The interior was crêpe-like, airy, and most definitely cheesy. I found the Gougère got better as it cooled and the inside of the pastry had a chance to expel all of the warm, moist air within. The only thing I might do differently next time is reduce the heat in my oven to 375 after 15-20 minutes, as I either have a hot-oven, or need to invest in a better baking sheet. The bottom got just a teeny bit browner than I would have liked. Either way, I don't think the Gougère will last long enough to mourn this potential error on my part. It is cheesy, buttery and delicious. My husband/official taster keeps telling me I'm over-thinking it, and it was great. He's usually right, so I'm going with that. I emailed Constance to see if there was a way I could improve on my technique. As always, she had the answer. Smart best friends are good like that. For the next batch I baked the Gougère at 400 degrees for 20 minutes, then turned the oven to 375 for 20 minutes more; for a total of 40 minutes cooking time. This batch was delicate, with a crispy crust, and was not overly browned or crunchy on the bottom. Whee! Gougère with gouda - compared with gruyère, this batch had a creamier texture and flavor, but less piquancy. They browned beautifully in the glass pie dish. Glass definitely has its advantages for this recipe, as I found myself prone to over-browning them, and the Gougère cooked in glass had the best bottom-crust of all. Another day, another post. Enjoy. P.S. Thank you Constance for the wonderful recipe. Thank you for being a perfect lunch companion, with a love of food that more than matches my own. Most of all, thank you for 10+ years of friendship. I don't know what I would have done without you. See you next week at Max's. They look really good!! You and Stan sure know how to eat!! 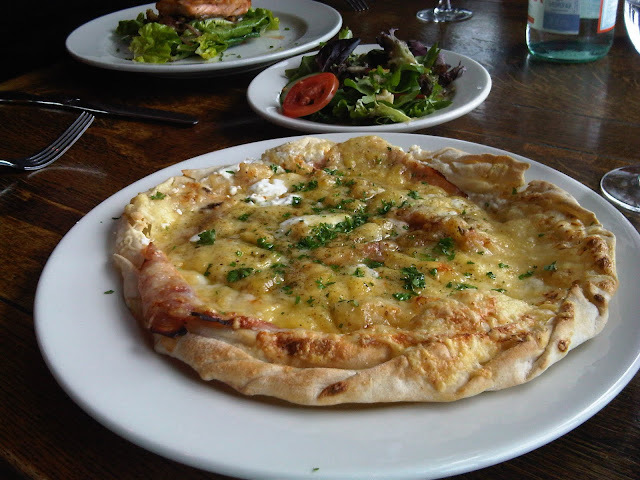 I was searching on the internet for the recipe of Maximillien's Tarte Flambée Paysanne, which I also had there recently, and here you have mouth-watering photos of it!! But not the recipe! I really want to make that Tarte, and could probably wing it and come up with something similar. But it was, as you said, "life-changing, make-your-toes-curl, delicious." I agree completely!! Now....how are we gonna get that recipe?! @Anon, sorry to tease you! =) I will try and pry a recipe out of them on my next visit. I think the key to this would be getting the pastry crust right. It wasn't as heavy as a pizza dough, but it was sturdy enough to hold up to toppings. I see a challenge in our future! If you figure it out I hope you come back and post the results! @Davina, that's 4 for 4, I am totally impressed. You are awesome! Good job it looks very good! And thank you for the kind words! Mix the flour with the salt, add the oil and water. That's about it... Let it rest before you roll it as thin as you can. @Maximilien Seattle, THANK YOU THANK YOU THANK YOU!!! =) I'm going to try that very soon!